The 14th book in the marvelous British police procedural mystery series that starts with A Share in Death. Family life has always been complicated for Detective Superintendent Duncan Kincaid and his wife Detective Inspector Gemma James and now they are foster parents to young Charlotte. Gemma is finishing her family leave by planning an Alice in Wonderland themed party for Charlotte when Duncan gets called in to consult on a case right before he’s due for his turn at family leave. The setting is charming: Henley, a village on the Thames River thirty-five miles from London where Detective Inspector Becca Meredith is secretly in training for a possible spot on the women’s Olympic rowing team. Respected but not well-liked, Becca rows alone, and disappears after an evening row. Reported missing by her ex-husband Freddie, search and rescue teams are called in, and we meet Tavie and her dog Tosh and Kiernan and his dog Finn. Kiernan is also a rower, and is making a beautiful wooden scull for Becca, his lover. To complicate matters, a retired police commissioner lives nearby, whom Becca accused of assault a year earlier. 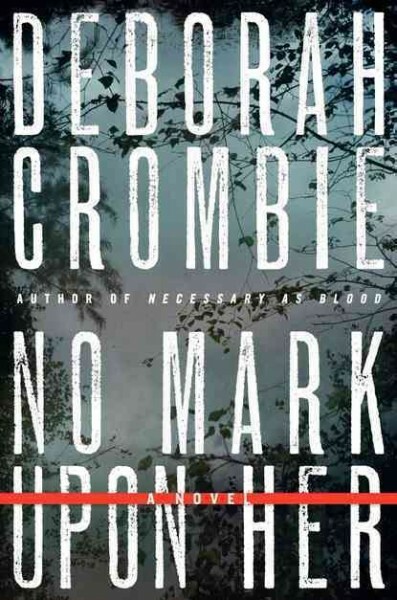 No Mark Upon Her is an intriguing mix of the domestic life of Duncan, Gemma and their friends, the setting of the quaint village with competitive rowing and rescue dogs, and violence and suspense added in.